Any idea what's wrong with my plants? This is one of my Ghost Pepper plants. It's almost 2 years old and this is as big as it's gotten all this time. I was told to move to a bigger planter, and I did.. but it's still not branching out. It grows a few leaves, they turn yellow and fall off.. the plant never getting any bigger than it is. Another pepper plant, not sure what kind because this is as big as it;s gotten. I grew it last spring and this is has far as it's grown. It never has more than two leaves on it. 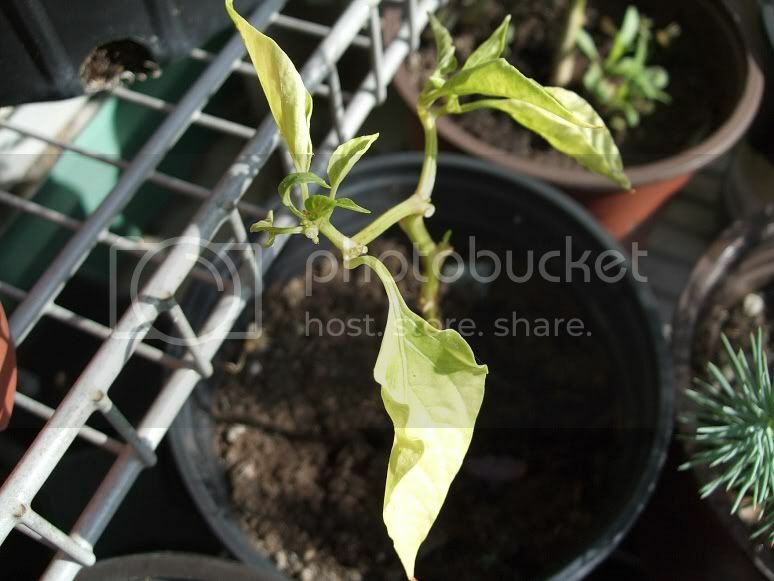 Yet another pepper plant doing poorly.. was also grown last spring. This is a cactus I grabbed from another plant. I rooted it in the dirt and the new growth started to grow on top.. then, out of nowhere, the base started to whiten, shrink, and fold in half. I am sure this will be dead in another week unless I cut off the new growth and begin the process of rooting it. All my pepper plants grew very nice last year, except for the ghost pepper.. that has always had a problem. This year, my plants are looking like crap and I am on the verge of dumping them all into the trash and giving up on a garden this year. All of the new seedling I started growing this year have suddenly died off.. so the only plants I have left, as these, and they're on the way out as well. It's to the point that it's not worth having a garden this year, unless I go out and spend hundreds of dollars on already established plants. I'm sorry you're having trouble with your plants. It's always frustrating when they don't do what they're supposed to/you expect them to do. Well, it's hard to say without all the details, but just looking at the photos, the soil in the "another pepper" looks heavy to me. The other ones look overly peat moss-y, if you know what I mean. My favorite soil mix recipe is 2 parts garden soil, 1 part compost, and 1 part sand. I add dolomitic lime, greensand, and rock phosphate. Other people may not agree, though (that's the hard part -- there are SO MANY different ways). If you want to buy a commercial potting soil, my current favorites are Gardener's Gold Organic POTTING soil and Pro-Mix Ultimate Organic Potting soil. One time that when my seedlings turned yellow and rapidly declined, I had tried just mixing Bumper Crop soil amendment (kind of compost) and sand together. Hope you get more responses and we can pin down what the issues are. I agree with AS that the soil looks heavy. In addition, the pH may be wrong. If the pH isn't right, plants can't absorb nutrients from the soil. The peppers look like they're starving for nutrients, and that doesn't mean you should add fertilizer. It means they can't access what's in the soil. Test the pH. The peppers would be happy in neutral to slightly acid soil. 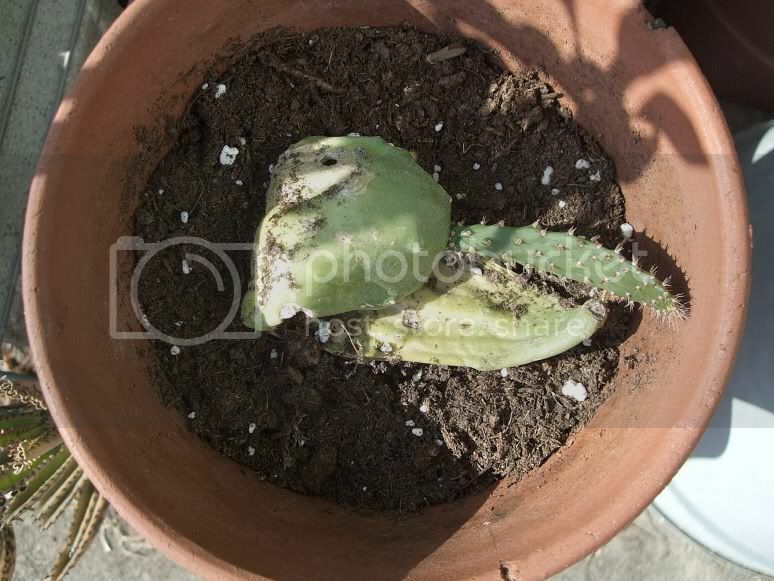 The soil in the cactus pot doesn't look like it has nearly enough sand and grit. Desert cacti grow in alkaline soil, with very little in the way of organic material. The turning white and folding over business sounds like you might be overwatering, as well, or else the soil doesn't drain quickly enough. Those are my thoughts on the situation, anyway. Last edited by Kisal on Thu Mar 24, 2011 2:24 am, edited 1 time in total. I bought some good soil, and a ph tester. Hopefully soon, they'll get better. I'm wondering if it's got to do with the harsh sun. They get sun from about noon until sundown. There aren't any trees in my area, so they get no shade. Those are full sun plants; the afternoon sun shouldn't bother them, once adapted (though if they just came from indoors they would need to be adjusted to it gradually). I agree with the other posters, it is soil and water issues. But personally I would give up on the peppers and start fresh. I have peppers I started from seed the end of Jan (THIS year) that are way bigger and healthier than those. Even if you get the conditions adjusted so that they start doing better, they will always have that history of a year of being stunted and who knows what has happened to the roots in the meantime. Get the conditions right and then start some new plants. Richee, I am a totally laissez-faire gardener. "Hey, looks like poison ivy shoots! Cool, let's see it grow!" I have a few plants that are considered annuals that we can grow in Florida over the winter and maybe have them hang on for a couple of years or more. It's kinda interesting to me to see the senescence of these older annuals. It could be just old age, or maybe soil pathogens. I have Catharanthus roseus, or rosey periwinkle that's maybe five years old. I cut back to just sticks every late winter and it keeps coming back, but this year, all the new foliage is kinda twisted and pale. Three Lantana camara are doing just great in their sixth year, but three more are markedly behind and spindly while the soil is the same for four of them. And my Crossandra infundibuliformis is only entering its second year, but looks as bad as the periwinkles. I would have thought crossandra, an Acanthaceae, would rebound as do others of that family, but it's looking really pathetic: like your ghost peppers. 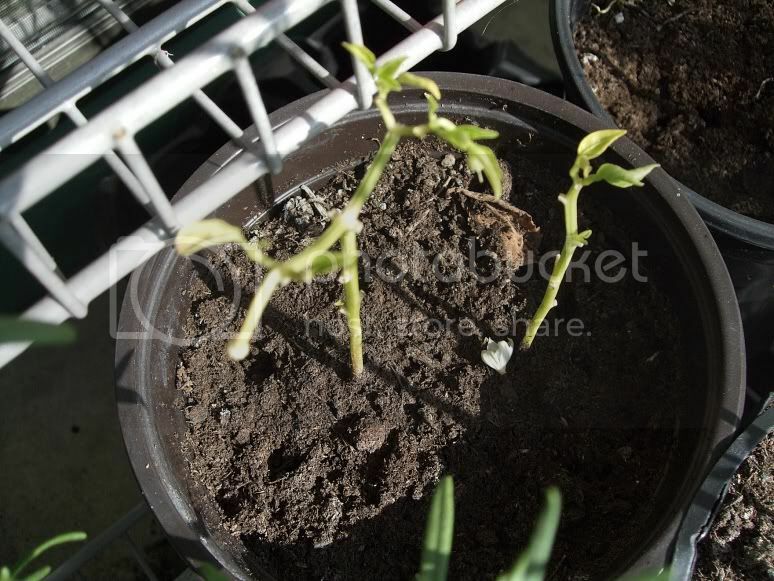 So while you can regrow plants like peppers, they will not do well indefinitely year after year. I don't know if it's natural senescence or aging, or if its gradual susceptibility to disease, but you are better off growing new. In most of Florida, we can grow anything for a little while at some point in the year. We have stuff growing in the wrong zone, with the wrong water or salinity or soil, but we also grow more diseases and pathogens. Start again with new plants in new potting soil. It's hard to start fresh from seed, because it takes forever for me to grow them. I see people grow huge plants from seed in about 2 months, but for me.. it will still look like a new seedling 3 months later. I don't know how other people do it. Maybe they use a green house or something, or some kind of growth agent. If I start new plants now, they'll just start blooming around Christmas time. Can you tell me exactly what I would need to get them growing good? Like the exact soil (brand name and soil type), as well as any fertilizer, ect. And any sun/light/housing conditions would also help. I start the pepper seeds indoors in late January, in my somewhat chilly basement. No greenhouse or other fancy equipment and no humidity domes. They are on a heat pad to germinate, but come off it once they have true leaves. They take maybe 10 days to germinate and another week or so to start getting true leaves. They are in regular Miracle Grow potting soil. I start them in little cells. Once they have true leaves, they are moved to 3 or 3.5" plastic pots. They are under regular fluorescent tubes (4 tubes across a tray of pots) with the lights just a couple inches above the plants (on chains so they can be raised as plants grow). Lights are on 16 hrs a day. They are all in trays and I bottom water only, pour just a little bit of water (1/4" or so) in the bottom of the tray each AM. There's pictures of my set up in the Seed Starting section. That is it, nothing fancy. The MG soil has fertilizers built in, so I don't give them much else, but this year I have put some of the leachate from my worm bin in the water occasionally. Other years I have used a little of some other organic ferts (but the MG is inorganic). I will try to take some pictures of them tonight. They are at least 6" tall now, bushy and leafy. They are likely to start blooming before the weather is warm enough to take them outside in April. It might be that I've given them too much water. I stopped watering until they began to look a little 'wilted', then watered them a little, then waited again til they started to wilt. They started growing good and looking better.. nice dark leaves started forming all over the plants.. then we've had 2 days of non-stop rain. It's going to be hard for the next 3 months to keep them on the dry side. I've also planted a few more in new soil, and have them in a mini green house outside, we'll see how that turns out. I got 100% germination in my peppers this year by putting them in a damp paper towel and almost totally sealing them in a plastic ziploc baggy. I did by a heating pad but instead i put the baggies on the furnace. it was crazy! I didn't expect 100% so I ended up giving away a bunch of germinated seeds. I now more peppers than I can handle in cells. I need to up-pot them but I don't know what room I'll have left for tomatoes and ground cherries/tomatillos! Unfortunately for me, it's been raining for 6 days now, non-stop. The pepper plants that had peppers on them, have dropped them, and most of their leaves. We got an estimated week more of rain ahead.. I guess by the time the rain spell is gone, all my plants will have died from root rot.. but what can you do? I can't bring in most of my plants because 97% of them are inhibited by red fire ants. I don't need to bring in 52 colonies of fire ants to devour me in my sleep. My plants just never seem to get a break. Maybe you could build a simple rain shelter for them. Like with translucent corrugated roof panels or something? (I know some people who used them for barn roof -- let's diffuse sunlight in). If they're removable, you could store them away in case of strong storms etc. that would be no use and could potentially just rip/blow them away. Keep the containers elevated on cinder or paver blocks out of standing water, etc. I know what was wrong. I moved one of my Ghost Peppers and another plant that was doing very poorly out front where it gets shade most of the day. About 2 weeks later, they look better than any of my plants... like ones you'd buy in the store. I couldn't figure out how plants that require full sun would do poorly in full sun, but great in the shade.. then it hit me. I think the planters were heating up and making life miserable for the root system. If you dig a hole in the ground, it's nice and cool in there... but inside the planter, things were heated up. If you try picking up a black plastic planter that been sitting in the sun, you'll see what I mean. So I went ahead and planted almost all of them into the ground. I live in an apartment complex, with limited space, so they're kind of cramped, but doing great. The Ghost Peppers pictures on top lost the two plants around it, but the biggest one survived. 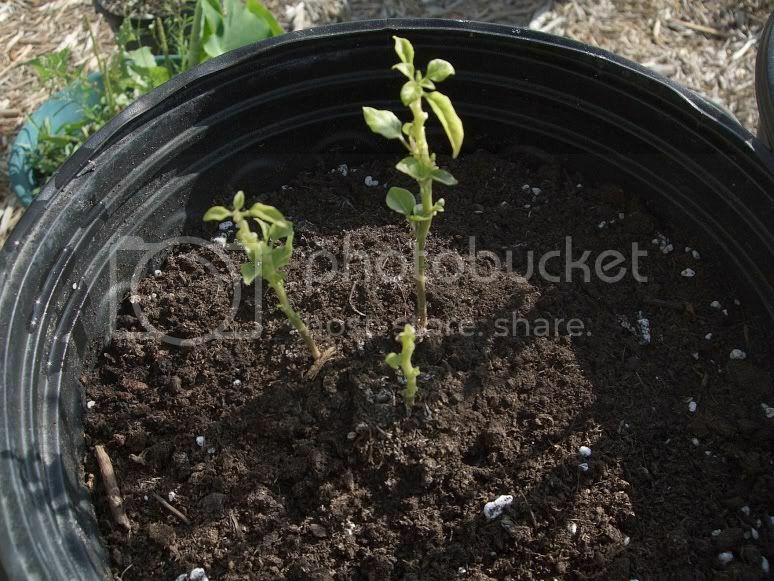 I put it into the ground and the next day the leaves were shriveled up and brown. I almost pulled it up and threw it out.. but I let it sit for a few days, and new leaves are growing now. I guess it went into a temporary shock, then decided it loved where it was moved and started to come back. The two little ones that were in the same pot died from dampening off, when we had another fit of rain. I don't think it will be a problem now because it's in the ground where it is much cooler. The second plant picture is doing very well also. The third one also died from the rain, both in the planter. So I guess if you're going to have plants in planters, better have shade for them. URGENT: what is wrong with my plants?